This month Wayward Music Series and Patchwerks host one of the most notable figures to originate from the explosion of Krautrock's propulsive minimalism of the late 1970s, a wave of experimentalism that birthed Can, Neu!, Amon Düül II, and Ash Ra Tempel. The latter half of the decade also saw a concurrent generation of German electric invention in minimal and synthesizer explorations from the likes of Popol Vuh, Asmus Tietchens, Conrad Schnitzler, Harald Grosskopf, Harmonia and members of Cluster working both in and out of solo modes. Both of these facets of the burgeoning German experimental music scene detailed by Jon Savage, in the pages of The Guardian's, "Elektronische Musik: A Guide to Krautrock". For converts of the sound, original editions and even official reissues have been scant going on decades, but recent overviews like Soul Jazz' "Deutsche Elektronische Musik" and Light in the Attic's recent foray into shared territory with, "The Microcosm: Visionary Music of Continental Europe" have brought new attention to their explorations. Further timely unearthing of these Kosmische explorer's work, the early works of Asmus Tietchens have seen a handsome series of reissues from Bureau B, and Harmonium received a lavish box set repress of their central albums on Grönland Records, the first official release of it's kind in decades. Likewise, this past year also saw the official reissue of a lavish assembly of music by the trio of Hans-Joachim Roedelius, Dieter Moebius, and Conrad Schnitzler as the Cluster 1971 - 1981 box set. In an interview for for Perfect Sound Forever Roedelius chronicled the intersection of this most notable outfit within the Krautrock and Kosmnische scenes as an outcome of his and Schnitzler's founding of the Zodiak Free Arts Club. The venue acting as a attractor and confluence of the existing minimalist strain of psychedelic rock, performance art and theater and what Roedelius calls "free jazz meets electronics". A regular of the venue, Dieter Moebius became the third element in their improvised music theater trio, then named Kluster. As a follower of Joseph Beuys and the Fluxus movement, Schnitzler found other like-minded galleries and museums receptive to hosting their explorations in sound and performance. Thus began what what Roedelius refers to as Kluster's "somewhat endless European tour of improvised shows" in 1970. Though Schnitzler came to depart from the trio, his contacts within the music world brought Moebius and Roedelius into the influential sphere of producer Conny Plank. This fortuitous meeting would be a catalyst in further cementing the disparate aspects of the existing Krautrock and Kosmische sounds into shared culture, producing notable cross-pollinations like that of Harmonia. Intersecting in the space between the repetitive motoric vocabulary of Michael Rother's work in Neu! 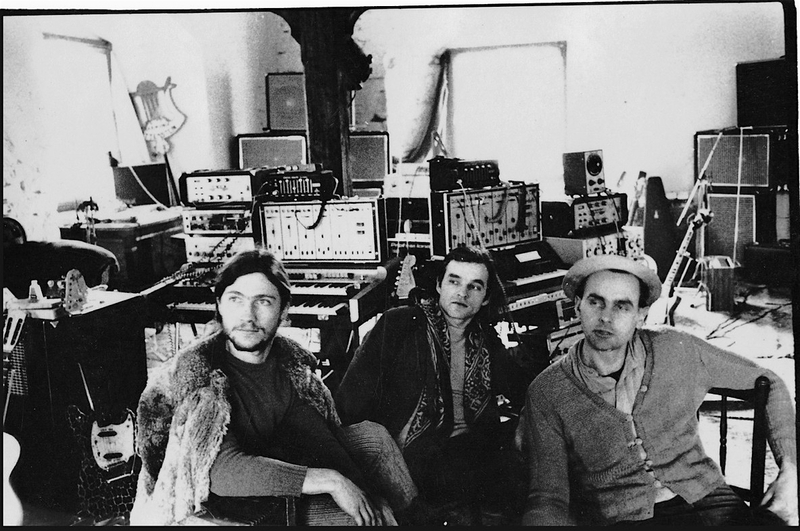 with Moebius and Roedelius' freeform synthesizer explorations, Harmonia could be considered the genre's sole supergroup of a style. Documented in Alex Abramovich's "The Invention of Ambient Music" for the New Yorker, their open-ended freeform performances in gallery and theater spaces following the release of 1975's "Deluxe", attracted the attention of British producer extraordinaire Brian Eno. The shared solidarity in musical exploration and synthesis would culminate in September 1976 in an 11 day stayover in Forst Germany where Eno lived and recorded with Harmonia, producing the material that would become "Tracks and Traces". Bridging of the German Elektronische and Krautrock scenes with the then developing sounds heard further west in Great Britain, this work would proceed Eno's influential production in the pop world on his trio of albums for David Bowie. The meeting also acting a catalyst toward his own collaborations with Moebius and Roedelius; Eno's now canonical "Music for Films" and first volume in the ambient series, "Music for Airports" followed directly on the heels of the collaborations spawned by this meeting of "Cluster & Eno" and their second album, "After the Heat". A accelerated period of productivity for the British producer, the quartet of epoch defining ambient albums in this chapter of "The Discreet Music of Brian Eno" culminating in 1982's "On Land". What the ambient series shares with his German contemporaries Eno himself would describe in the pages of Sound on Sound magazine as, "A Fervent Nostalgia for the Future".